Acrylic Duck Call – Clear Green – SALE! Model 650 Injected and cast in Acrylic. 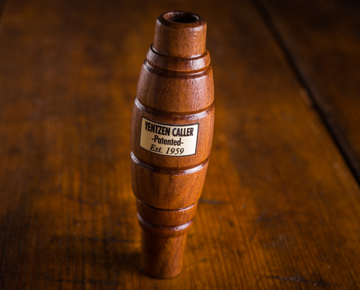 This is the most Raspy Mallard Hen Call by Sure-Shot Game Calls! This call helped begin the Ducks Unlimited Green Wings Program, because of it's ease of use and dependability. Everywhere the Sure-Shot team travels, someone tells a story of how this was their first call! The Sure-Shot 650 line is a legend in the duck hunting industry. Born from our YENTZEN Classic double reed, but with more volume, which has taken it to the next level with a unique sound chamber in the poly body. Like all Sure-Shot calls, it blows wet and it's easy to adjust patented double reed system performs the quack, feed call, and high ball sound of the mallard hen, like no other on the market. It doesn’t get any better! Acrylic Duck Call – Clear Orange – SALE! Acrylic Duck Call – Smoke Grey – SALE! Acrylic Duck Call – Clear Red– SALE!